The Xitou Nature Education Park Experimental Forest in Taiwan is managed by the college of Bio-Resources and Agriculture, National Taiwan University and showcases the natural environment and forest biodiversity of the region. To ensure the safety of tourists and researchers, a new bridge has been built to cross a river in the park. Due to the sensitive environment of the park and keeping in mind the need for sustainable management, wood-based materials were selected. The bridge was designed by National Taiwan University Department of Civil Engineering students and features an elegant design with sweeping curves. Wood for the project was logged from the Experimental Forest’s small to medium size fir and cedar stock. Tanalith® Q copper quaternary based preservative treatment was selected to provide durability. All timbers were kiln dried after treatment prior to lamination and fabrication. The bridge spans 40 meters, is 1.6 meters wide, and uses a total use of 70 cubic meters of wood. Construction was managed by the National Taiwan University Suili wood utilization center and took 6 months to complete from setting of the foundations and preparation of the glulam beams to installation on the site. 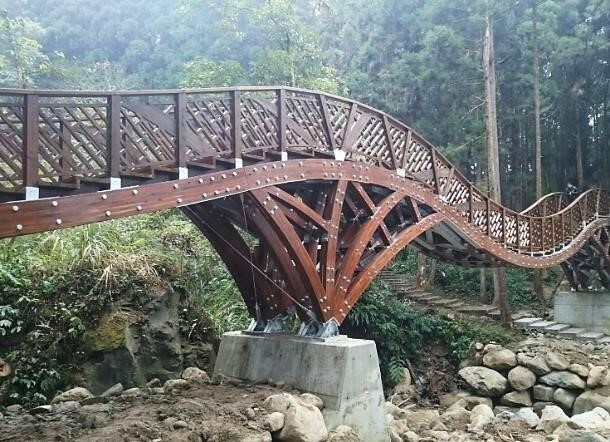 This engineered wood bridge is a good example of a sophisticated and ambitious design using small size treated timbers and glue lamination technology.